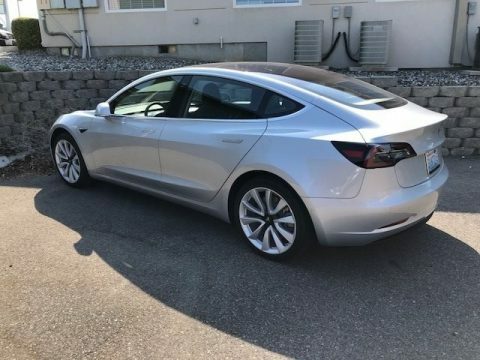 2018 Tesla Model 3 Long Range Sedan for sale in Richland, WA 99352 Amazing by any standards, this 2018 Tesla Model 3 Long Range is proudly shown in a Silver Metallic exterior. Powered by an all-Electric, Rear Wheel Drive system and a Single Speed transmission. This single speed transmission provides you with an estimated driving range of nearly 310 miles and 258HP. Also enabled on this nearly new Tesla is the famous Autopilot mode that makes driving so much easier. The premium textile interior is intuitively designed with full power accessories, panoramic roof, heated front seats, and 60/40 split folding rear seats. Everything you need to maintain a seamless connection is close at hand including a prominent central touchscreen display, Bluetooth, available Wi-Fi, and Navigation. Spectacularly innovative, this Tesla Model 3 also provides peace of mind with advanced safety features including a rearview camera, airbags, stability control, and traction control. Warranty Information (Transferable Through Tesla): Original Manufacturer’s Bumper-To-Bumper Warranty Good Through 2022 or 50,000 Miles Original Manufacturer’s Warranty for Long Range Battery(75kW) Good Through 2026 or 120,000 Miles Call (402) 502-8385 for more information. ATTENTION BUYERS! *Caveat Emptor* Please Remember to Inspect Vehicle Prior to Purchase!